Sample 14-day study tour to Madras, Kanchipuram, Mahabalipuram, Madurai, Chettinad, Delhi, Jaipur, Ajmer, Jodupur and Udaipur. Meet your tutor, programme co-ordinator and fellow students at London Heathrow for an overnight flight to Madras. Afternoon city tour of Madras including visits to Fort St George, St Mary’s Church, the Government Museum and Art Gallery, Kapaleshwara Shiva Temple and Marina Beach. Spend the day visiting the ancient Chola temples at Kanchipuram and Mahabalipuram. Kanchipuram is known as the ‘golden town of a thousand temples’ and is one of the seven most sacred Hindu cities in India. Mahabalipuram is an open-air museum of temples and sculptures and is most famous for its weathered shore temples. Visit Kalakshetra – an institution devoted to Indian music, dance and weaving. Fly to Madurai. Afternoon city tour of Madurai which will include the famous Shree Meenakshi Temple which houses over 33 million sculptures. Morning visit to Chettinad to see the intricately carved Burma teak wood homes of wealthy merchants. Afternoon at leisure. Drive to the hill station of Kodaikanal. Of the three hill stations in the South, Kodaikanal is undoubtedly the most beautiful and an ideal place in which to relax. Drive to Coimbatore and then fly to Delhi. The following morning, tour Old Delhi to see the Red Fort followed by a cycle rickshaw ride through the colourful streets and bazaar area. Afternoon tour of New Delhi, which includes many buildings by Lutyen’s. Evening drinks and dinner at the Delhi Golf Club. Transfer to the railway station for the express train to Jaipur. Transfer to the hotel. 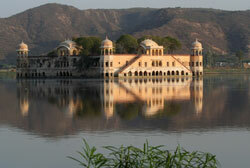 Afternoon tour of this famous ‘Pink City’ with its City Palace complex, Observatory and Palace of the Winds. Afternoon tea whilst watching a polo match. Dinner in the City Palace with the Maharajah of Jaipur. Drive to Ajmer for a special visit to Mayo College, established in 1874 as the school for Indian Princes. In 1947 the school was opened to commoners but remains a leading educational institution for the elite. A tour of the college will be followed by a private audience with some of the masters. Lunch at the school. Afternoon drive to Khimsar Royal Castle (185kms/4 hours). Dinner with members of the ruling family. Sunrise desert jeep safari to look for blue bull, black buck and wild hares. After breakfast drive to Jodhpur. Afternoon tour of Jodhpur and its massive Mehrangarh Fort. Tea with the Maharaja of Jodhpur. Overnight at a private heritage hotel – Fort Chanwa or Rohet Garh. Morning jeep safari to visit local Bishnoi villagers, who live by the ecological beliefs of their spiritual leader – Jambeshwarji. A traditional welcome will be made by the head of the village. Drive to Ranakpur Jain Temple complex, which is one of the largest and most impressive Jain sites in India. The main Chamukha Temple covers an area of 40,000 sq. ft. and has 29 halls containing 1,444 pillars. Drive to Udaipur for the next two nights.. Morning tour of Udaipur with its white palaces and temples. Lunch cruise on Lake Pichola on board a traditional Royal Gangaur boat. Farewell dinner in Udaipur City Palace complex with the Maharana of Udaipur. Fly to Mumbai and on to the UK.